when i was ten, my mom got pregnant with my youngest brother dane and for some reason she just got itchy feet and decided she wanted to move from murrieta, where i had lived my entire life. it was a perfect place to me and i loved living there when i was little. it was a small town and it was underdeveloped and i have so many fond memories of my childhood there. i remember being apprehensive about this big move to orange county, as any ten year old would be, and i was sad to leave my entire life behind. looking back now, i see that moving here has been the utmost greatest decision my parents could have ever made for me, and this place that i call home has given me so many opportunities and advantages and life experiences. i know everyone is proud of where they're from but i really have such an affinity for my hometown of coto de caza. i might even be a little bit obsessed, i'll admit, but i just love this place. and i loving calling this perfectly manicured and surreal community my home. 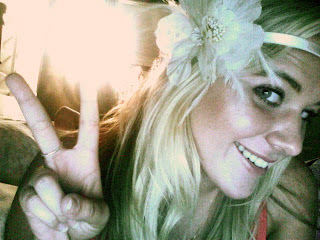 on a side note, i added this baby to my collection of headbands. not as big as the others, but such a cutie. you can't see, but it had sparkles and feathers and sequins. i love you emma. i received your complaint, and will work on being a better fan club president.